It may not get as much press as the Derby della Madonnina or Derby della Capitale (Rome versus Lazio), but the Derby della Mole is certainly one of the fiercest. The 165th meeting between the two teams is truly a David and Goliath tie. 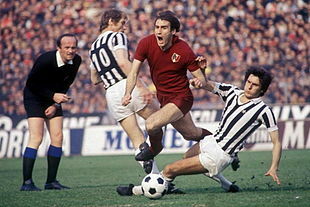 Torino go up against Juventus on Sunday, having not won the Serie A giants in 16 occasions. So, after all this is the oldest derby is the Serie A. Juventus first played Torino on January 13 1907, Granata’s first competitive match following their foundation the prior year. Also born the same year, was the socio-economic dimension, Torino – represented by proletariat and Juventus who are represented by bourgeoisie. The proletariat is a term used to describe a class of wage earners, mainly industrial workers, and in this case, working in the car factories in Turin. Proletariat’s tend to earn fairly low wages and football is a way to unleash the passion. On the other hand, bourgeoisie see themselves as middle-class, typically composed of businessmen. There’s no doubt that despite being in the bottom half of the Serie A, Torino will give it their all to earn bragging rights over their inter-city rivals. “Like in a derby in any league, two teams from the same city hate each other, both teams want to be the best and some fans take their passion to extreme levels and do stupid things,” said Marco Messina, a Juventus fan living abroad. 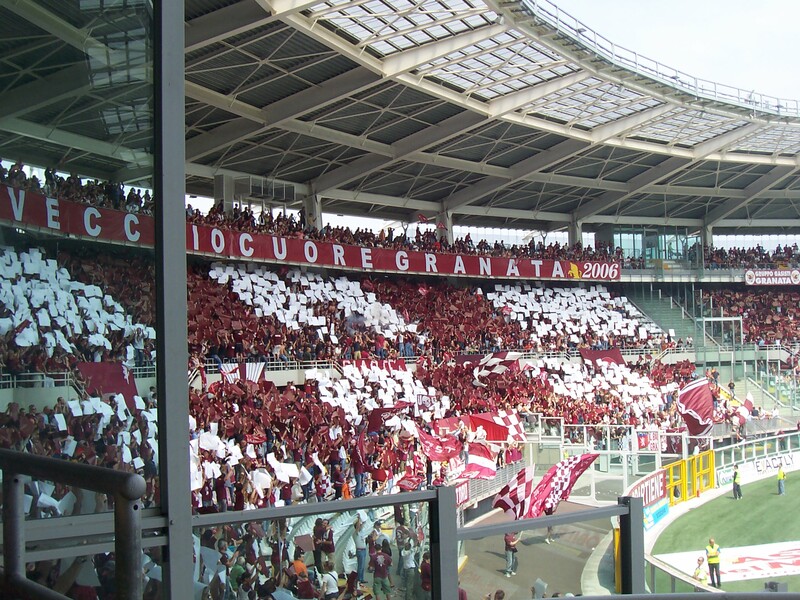 For Torino, this is the biggest match in their calendar: “The players want to give something back to the fans. Winning this for them is like winning the Scudetto,” said Messina. The Bianconeri have been the dominant of the two teams, with Torino’s last win dating back to the 1994-95 season. Torino’s last goal against Juventus dates back to the 2001-02 season, and towards the end of the last season lost Ciro Immobile and Aleesio Cerci. If there wasn’t tension before the derby, there certainly is now. Unfortunately, Italian football is still marred by violence, with both clubs having been previously fined for vandalism and offensive chanting. “The lack of effective leadership within the Italian Federation leads to this,” said Messina. Torino have struggled of late and will do well to get any type of result at the Juventus Stadium. The visitors find themselves in 15th, having not found the back of the net in four of their previous five games. Their counterparts however, are at the summit of the Serie A, having only lost once this season the league under Massimiliano Allegri. It is the morning before the superclasico – River Plate versus Boca Juniors, a local derby that not only dominates the calendar but is also the lifeblood of Argentine football, gripping the nation. “The fan experience is the main reason to go to an Argentine game anyway. The quality of the football has declined but that quality on the terraces has not at all,” said BBC’s South American football expert, Tim Vickery. In the recent past, violence has long dominated headlines in Argentina, many games pockmarked and scarred with matches often breaking out in fights. Many of these are civil wars between rival factions of the same barra brava – who fight to control the income from ticket touting and match day parking. Following River’s death, in 2011 as Boca fans call it; there were many fights that broke out in the neighbourhoods, glass bottles flying, smashed windows and fights leading up to the famous Monumental stadium – putting more than 25 people in hospital after clashes during the match. Boca’s barra brava managed to smuggle their leader, Mauro Martin into the stadium despite him being banned. A monumental figure amongst the Boca support, Martin would be seen on the fence orchestrating orders both home and away. During the build-up to kick-off, choreographies are unveiled, massive banners, confetti and balloons are released and the stadium erupts with noise. 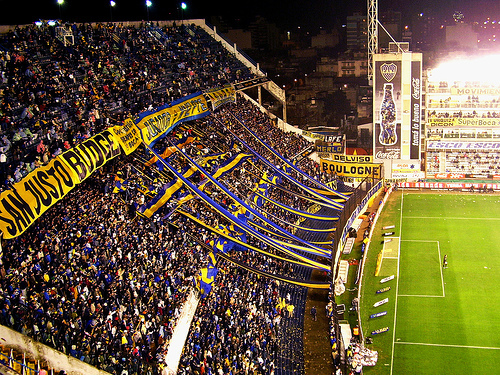 Whilst barra bravas are at every club in Argentina, they are most prominent in both River and Boca. River’s barra bravas have close links with the national government who were at war with the powerful media group, Clarin, which saw football become just one of the battlegrounds in Argentina. Just this week, the barra bravas of River Plate have already been in the headlines. A 100 strong mob attacked rival gang in a River Plate cafe, injuring many members of the public in an organised attack over limited tickets for the game against Boca Juniors. Barras were apparently from the Banda Del Oeste, the dissident barra at River, and Olé says guns were seen (though not fired) as well. “The organised fights of Barra Brava often taken place away from the ground, often near motorways. There is the lurking sense of danger at football matches in Argentina,” Joel Richards, author of Inside the Ultimate Derby. Argentina’s most serious-related football tragedy was that at the Monumental in 1968 where 71 Boca supporters had died in a crush as fans made for the exit. To this day, nobody has yet been brought to justice for the tragedy and exactly what had happened has never been clarified. In the next fixture between the two sides, the two sets of supporters sang the same song. No habia puerta, no habia molinete, era la cana que pegaba con machete. There was no gate, there were no barriers, it was the police thrashing out with knives. Between the Gate 12 tragedy and River and Boca’s barra bravas joining forces for political and financial interests in 2009, the violence in and around football in Argentina has steadily increased. Families travelled from Europe, namely Spain and Italy to the south of Buenos Aires, settling in the dock area of La Boca. Football clubs emerged in working-class areas in the Argentine capital but a dispute between youth over who was the better team, Los Rosales or Santa Rosa, resulted in both sides deciding to join forces, and so The River Plate was born. Through the narrow streets of La Boca, two of the club’s founders noticed red ribbons hanging from a float claiming to carry ‘The Inhabitants from Hell’. Risking the wrath of the owners, the youth ripped the ribbons down and draped their white shirts, providing the team with a strip. Streets away, Independencia Sur were looking for a new start, names were mentioned but owners decided that the neighbourhood should figure in the name. Days later, they had opted for Boca Juniors, and so a local rivalry was born. “The area around Boca is characterised by lack of space, pokey little streets,” said Vickery. For 20 years, both clubs had battled it out for ownership of the area, and with narrow streets and little space for the two of them – it was time for River to relocate in Recoleta before moving further north to a barren area in 1938. To this day, River find themselves situated on the edge of Belgrano and Nunez, an open space which allowed them to build the largest stadium in the country, and so the Estadio Monumental Antonio Vespucio Liberti was born, named after legendary club president, Antionio Liberti. Argentina, known for its wine, steaks, ice cream, and of course, two of the greatest footballers to ever grace this planet, Diego Maradona and Lionel Messi. An icon for Boca, Maradona stayed at the Argentine club for just one season before joining Barcelona, returning to La Bombonera in 1995 as a legend and a World Cup winner. When Maradona had signed for Boca the first time round, River had softened the blow by signing Valencia’s Mario Kempes, despite being injured. Despite missing the first superclasico, Kempes was fit for the following clash, ending in a 1-1 draw in which Maradona was the scorer for Boca. The great Kempes once told reporters: “Central-Newell’s, in Rosario, is different,” he explained, “Because they are the two local sides they are fighting over who is the best in the city, for hegemony. In Cordoba, where I also played clasicos, it is very similar. The build-up is intense, players prepare for the game like any other but nothing gives you that buzz of a clasico. Following River’s promotion back in the top flight, the superclasico has raised in intensity levels – police on high alert during the hours of build-up to the game. Aggression, chanting, and most importantly, passion will entice viewers around the globe. Joel Obi’s second-half equaliser was enough to earn Inter Milan a point as two of Italy’s greats, Pippo Inzaghi and Roberto Mancini faced each other for the first time as managers. A wonder goal midway through the first half was enough to give Inzaghi’s men the lead going in to half time. However, Inter battled back and equalised through Joel Obi 15 minutes in to the second half. Zdravko Kuzmanovic told Sky Sports: “Inter needed a night like this. We didn’t communicate well at all, but in the second half we played a great match. Both Milan clubs have struggled in the Serie A of late, and this season is no different. Milan started the game in eighth, just one point above Inter in ninth. Mancini returned to Inter for a second spell, picking up eight trophies in four seasons. The Nerazzurri have struggled to score of late which is what ultimately cost Walter Mazzarri his job, with just 10 goals in the past nine games, after putting seven past Sassuolo on the second match day. Previous encounters has seen just five goals scored in the previous four matches between the two sides, with neither team managing to score more than once in those fixtures. Inter looked like a different side under the 49-year old Italian. Within the opening five minutes of the 213th Derby della Madonnina Inter pressed Milan high up the pitch, a sense of urgency from Inter as they looked to take an early lead. Mauro Icardi looked to score his eighth of the season as a stray pass from Sulley Muntari hit the Argentinian who was through on goal before Diego Lopez smothered the ball to safety. Jeremy Menez scored the only goal of the first half after 22 minutes following a well-executed counter-attack from the Rossoneri. The ball fell to Stephen El Shaarawy on the right-flank, whose cross found Menez and the Frenchman hit the ball first time beyond Samir Handanovic. The opening goal seemed to have taken the intensity out of the derby as Inter could not really carve out any real opportunity, to the disgust of Mancini who was barking orders from the sideline – as they went in to the break a goal down. Both sides started the second half like they did the first – with high intensity, putting their opponents under pressure. Lopez was called in to action for the fourth time and the Spaniard showed why he’s number one ahead of Andre Agazzi. The Milan goalkeeper got down low to deny Mateo Kovacic an equaliser 10 minutes after the restart. Persistence paid off for Inter as Michael Essien failed to clear his lines, the ball fell to Joel Obi on the edge of the box and the Nigerian found the bottom corner, out of Lopez’ reach. El Shawaary had a chance 15 minutes from time for Milan, but the Italian could only find the crossbar as Inzaghi looks away in disgust – the former Milan player would have surely put that away. Straight up the other end, Fredy Guarin’s cross found Icardi who took the ball on first time, unleashing a right-footed volley, which struck the outside of Lopez’ post. The result means Inter remain in ninth, on 17 points whilst their counterparts move up to seventh after Udinese drew 1-1 to Chievo Verona earlier today. AC Milan XI: Diego Lopez; Rami, Zapata, Mexes, De Sciglio; Bonaventura, Essien, Muntari, El Shaarawy; Menez; Torres. Hajduk Split refused to play Dinamo Zagreb yesterday afternoon in the Eternal Derby, after approximately 50 supporters were blacklisted from the Maksimir Stadium. Croatian media had reported that out of the 1,000 travelling supporters, 50 of these who made the trip from the Adriatic coast were listed as troublemakers, barring them from entering the stadium. Hajduk players followed suit and refused to play the tie, the biggest in Croatian football every season. According to Croatia FA rules, the match will be registered as a three-nil win for Dinamo, while Hajduk face a maximum six points deduction and possibly even being thrown out of the division. Dinamo director Tomislav Svetina told the clubs official website: “We will sue Hajduk to refund us the expenses of the match organisation. Hajduk only makes a mess of Croatian football. This is one of the saddest moments in Croatian football, and this was planned to create a chaos in our football. This is not the first scandal to rock Croatian football. 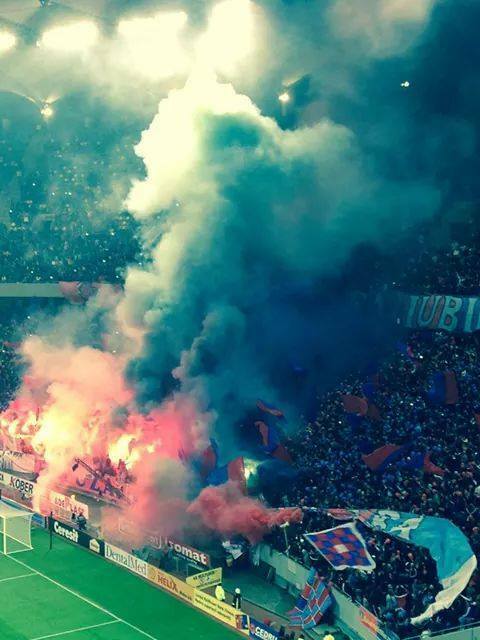 Just last week, Croatian supporters twice held up play against Italy in the Euro 2016 qualifier in Milan. Fans hurled flares on to the pitch as the Croatian FA to condemn their behaviour, urging the government to crush hooliganism. “Although Hajduk Split are lagging further behind their Zagreb-rivals, hardly making the fixtures decisive for titles. The Eternal Derby between Hajduk and Dinamo steals more or less all the attention and focus in Croatia,” Runar Nordvik told RivalTalk. The return tie in Split, is expected to draw a much bigger crowd as Hajduk always sell out at the Poljud stadium, providing great atmosphere when Dinamo arrive. Which is the opposite of the game in Zagreb as there are often boycotts. Since 2010, Hajduk have only won the Eternal Derby on one occasion, a 2-0 win in 2013 with Mario Pašalić scoring a brace, meaning Dinamo have dominated of late. 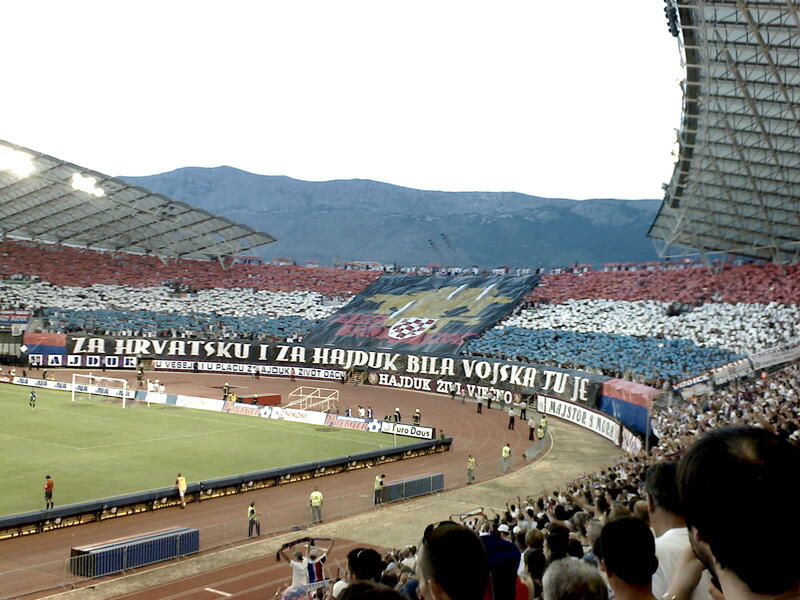 One of the most controversial transfers between the two teams is that of Niko Kranjčar who left Dinamo for Hajduk in 2005, and to this day the Bad Blue Boys (BBB), Dinamo’s ultras are yet to forgive him. 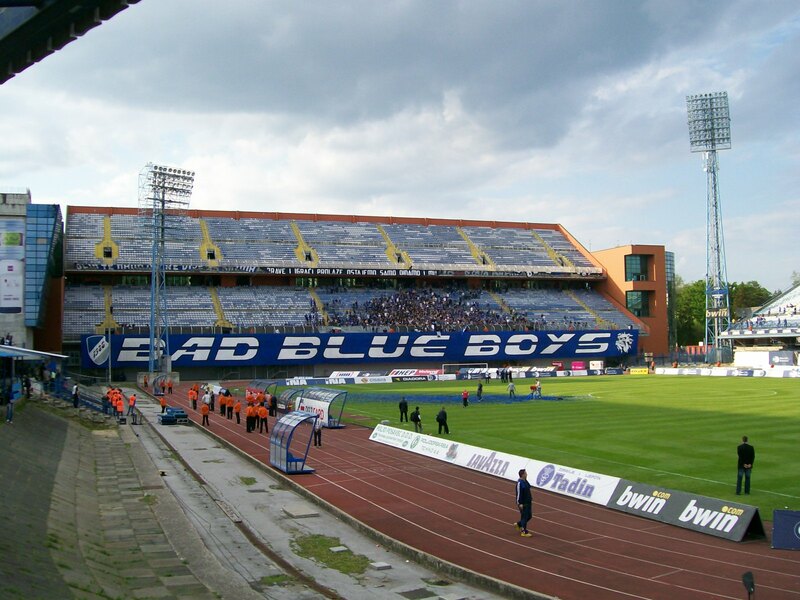 The BBB started up in 1986, alongside many other supporter groups in the former Yugoslavia who came in to the football scene in this decade. Hajduk’s ‘Torcida’ supporters group were the first recognised group in Europe when they came on the scene in the early 1950’s. Dinamo’s BBB became a major force in the hooligan scene back in the early 1990’s as the infamous game at home to Red Star Belgrade broke out in riots, making BBB also a symbol of Croatian independency. “The actual game has often been referred to as what made the Balkan Wars break out,” said Nordvik. At present, the BBB are still a force in Croatian football. Key game in the Serie A this weekend is the Derby della Madonnina. 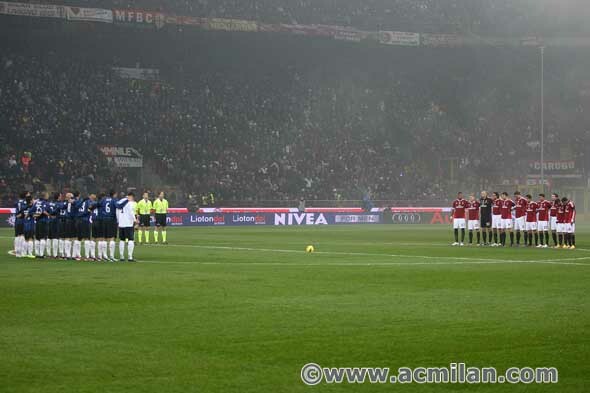 (Picture courtesy of AC Milan, Creative Commons). The Derby della Madonnina returns to the Serie A for the first time this season. It’s AC Milan vs Inter Milan and RivalTalk looks at the top five players who have featured for both sides. Whilst Andrea Pirlo is not known for his time at Inter, the deep-lying playmaker currently playing his trade for Juventus featured 22 times for the Nerazzurri. The 35-year old claimed that he could have been a “legend” at Inter had Marcello Lippi not been dismissed from the managerial role in October 2000. “When I see him, I am instantly reminded that, if he stayed on as Inter coach, I’d probably have become a legend there,” Pirlo said in his autobiography. Marco Tardelli took over the reigns from Lippi and Pirlo was loaned out to Brescia after failing to impress the new coach. “I won the European U21 Championship. Maybe he [Tardelli] did not recognise me at Inter, the fact that I never played. I suffered and wanted to scream so many times,” said Pirlo. The Italy veteran then moved to fierce rivals, AC Milan in June 2001, three years after making his debut for Inter. Pirlo came on to become a pivotal player for Milan, lifting two Serie A titles and two Champions Leagues, before moving to Juventus. Pirlo went on to make 284 appearances for Rossoneri in a decade, after making his €17million switch, which included Dražen Brnčić moving in the opposite direction. During his time at Milan, Pirlo was nominated for the Ballon d’Or on two occasions, as well as World Player of the Year, in which he finished seventh. Another Milan favourite, Clarence Seedorf played for rivals Inter Milan before making his move to the Rossoneri. The now 38-year old, started his career at Ajax, before moving to Italian side Sampdoria, before earning a move to Real Madrid. From here, Seedorf was almost ever-present, attracting the interest of Inter, who agreed a £21million transfer fee to take the Dutch international to the Serie A club. Unable to bring any major silverware to Inter, Seedorf moved on to Milan in 2002, in exchange for Francesco Coco, where he would become the key player in Carlo Ancelotti’s 4-3-2-1 formation. During his time at the San Siro, Seedorf helped Milan to the Coppa Italia in his debut season before winning the Serie A and Champions League, both on two occasions. The Argenine will be known for his two goals in the 2005 Champions League final, which will be known as one of the biggest shocks in European football, as Liverpool battled back from 3-0 down to win on penalties. “It’s hard to forget such a game, but now I’m proud to have been part of it,” said Crespo, on loan from Chelsea at the time. Crespo earned his move to Inter after finding the back of the net on 39 occasions in 54 games for Lazio, in a two-year spell. The Argentine only managed a season for Nerazzurri before earning a move to Chelsea, where he was loaned to Milan in 2004. Despite scoring 20 goals for Chelsea, Crespo was struggling to adapt to English football and was loaned back to Inter in 2006, for two-seasons, before making a permanent move. ‘The Phenomenon’ joined Inter from Barcelona in the summer of 1997, where he scored 25 goals in his debut Serie A season. The Brazilian moved to Real Madrid after scoring 49 goals in his five year Inter career, where he would then become one of the most feared strikers in the world. Injuries ravaged the striker during his career, where he only made 127 appearances in five years for Madrid, before moving to Milan in 2007, where he spent a year. Ronaldo is one of two players who have scored for both sides in the Derby della Madonnina, 1998-99 season for Inter and 2006-07 season for Milan. The Swedish striker arrived at Inter in 2006 and won three consecutive Serie A titles before earning a move to Barcelona. Having written an autobiography, Ibrahimovic had much admiration for Jose Mourinho, whom he worked under during his time at Inter. “Mourinho would become a guy I was basically willing to die for,” said Ibrahimovic. Ibrahimovic found the back of the net on 57 occasions in 88 games for Inter before his move to Barcelona, which included Samuel Eto’o moving the opposite direction. After playing under Pep Guardiola for one season, Ibrahimovic was loaned back to the Serie A, this time it was to Milan, where he would spend the season before making a permanent move to the San Siro. On November 14, Ibrahimovic scored the only goal of the game in a 1-0 victory against his former club, Inter Milan. Known for his strength and finishing abilities, the Swedish striker scored 42 goals in 61 appearances for Rossoneri, whilst winning the Serie A in the 2010-11 season. Linfield manager, Warren Feeney will be forced to watch the Belfast’s Big Two derby against Glentoran from the stands on Saturday. The 33-year old was sent off in the game six weeks ago against Ballymena in a management capacity, and the touchline ban is only being put in place now. “Unfortunately my ban is from the Ballymena game, which I don’t really know why – six weeks down the line from when it was but you have just got to take these things,” Feeney told Belfast Telegraph. Linfield play hosts to Glentoran tomorrow at Windsor Park, and the visitors will be looking for revenge having lost to The Blues last time out at The Oval. Feeney’s men have improved their form of late after recording wins over Glenavon and Dungannon Swifts to raise spirits having lost three games on the bounce. Glentoran on the other hand, have suffered a dip in form of late, with defeats against Glenavon and a cup defeat to Ballinamallard United. Former Northern Ireland international, Feeney is expecting Glentoran to put up a fight tomorrow afternoon: “They are a decent side and they play football the right way. I know how football works and if you aren’t fully focused on the job then you will get punished. “This will be a very difficult game for us. “It’s a local derby, a Big Two derby and although Cliftonville have been champions for the last two seasons I think everyone understands the magnitude of this fixture in the Irish League. The last meeting between the two sides ended in favour of Linfield as Glentoran threw a two-goal lead away before Linfield’s Aaron Burns scored the winner right at the death. Belfast Big Two Derby Football Glentoran Linfield Northern Ireland Sport Warren Feeney. 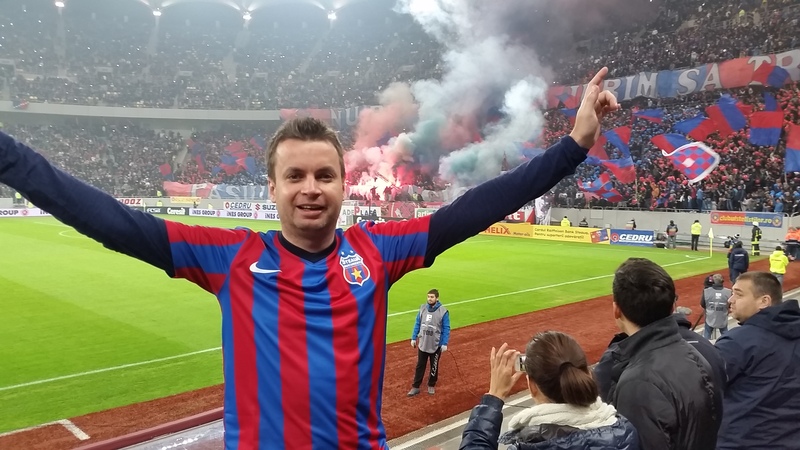 An Englishman from Herefordshire, a Bristol Rovers season ticket holder and an avid Steaua Bucharest fan, meet Daniel Lovering – who completed a 3000 mile round-trip to watch his team play. Following his father’s move to Romania in 2008, Dan’s first Steaua game was later that year, against local rivals – Rapid Bucharest. The match was played at Stadionul Giulești-Valentin Stănescu, a classic Eastern European style stadium – a bowl shape with a roof only covering one section of the stadium. Leading up to the game, police let the Steaua fans in one by one, literally: “A Steaua fan would enter the arena, get abused and then give some abuse back before being ushered to basically a cage near the corner flag. It was like theatre or the build up to an event in WWE wrestling,” said Dan. The game ended 0-0, but it wasn’t your typical bore draw: “The atmosphere was electric. 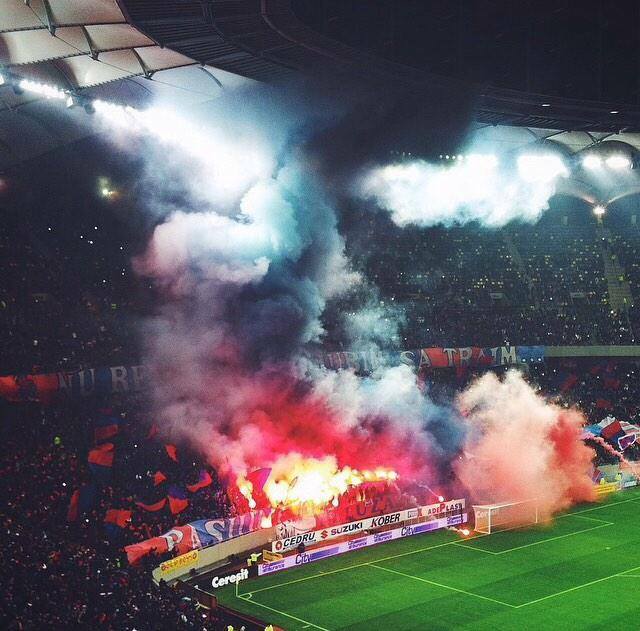 Flares all over the place, flags flying and Ultras jumping and singing about how much they hated Steaua. “It felt like a proper derby. Rivalry, Hatred. The stadium was full of people who cared for their team and despised their local rivals. Fireworks were thrown, Rapid fans were kicking at the barriers trying to get at the Steaua players taking corners. Having now seen Steaua play on six occasions, this was the first time Dan has attended the Eternal Derby – which Steaua ran out 3-0 winners. 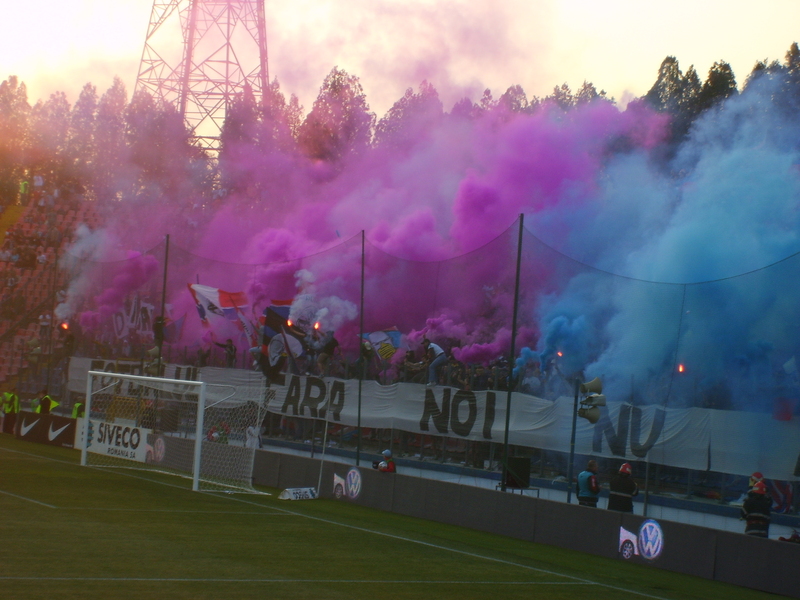 The Dinamo end unveiled a choreography of Charlie Chaplin whilst the Peluza Nord got a load of balloons out. “It would have looked really impressive in England, but I was a little disappointed because the Dinamo fans were making all the noise. “Once the balloons were lifted, Peluza Nord upped their game. Flares and flags started flying and smoke bombs started going off. It was a spectacular sight. The game finished 3-0 as Steaua sealed the victory with two late goals. The tie seemed to pass without any major incidents other than Steaua keeper, Giedrius Arlauskis, getting hit by a missile thrown by the Dinamo supporters. “The police presence was enough to deter any major trouble. I had a fantastic evening, the most amazing experience I’ve had watching football. Goals from Łukasz Szukala, Paul Papp and Claudiu Keserü gave Steaua Bucharest a deserved 3-0 victory over rivals, Dinamo Bucharest in the 157th Eternal Derby. The two teams came in to the match on mixed fortunes. Steaua lost their previous league game 1-0 against Târgu Mureş and came in to the game with an injury crisis in the forward positions. Whilst their counterparts Dinamo Bucharest, have won three of their previous five games, including a 3-2 victory against Pandurii Târgu Jiu last week. Tempers were already high and fans were in full, singing spirit hours before the game had even kicked off. Excitement in the city of Bucharest was upon us as the Eternal Derby is the game both sets of fans want to win – for bragging right. Upon kick-off, the Steaua fans enjoyed their pyrotechnics and balloons whilst Dinamo fans unveiled a choreography of Charlie Chaplin. Dinamo started off the better side with Kamil Bilinski having a chance after just seven minutes. The ball was crossed in from the right-flank, however a bobble on the pitch put the forward off, who couldn’t bring the ball under control. Marius Alexe then had a chance just moments later, but forced Steaua goalkeeper, Giedrius Arlauskis, in to making a great save. The tide started to turn then as Steaua looked to dominate. The home contingent shone a green laser in to the eyes of the Dinamo goalkeeper, who made a great save to deny Adrian Popa after quarter of an hour. Steaua then had the ball in the back of the net but the assistant referee has his flag up for offside, as Keserü was the wrong side of the defender. Popa then continued his fine start to the game as he crosses the ball in towards Keserü – but Traian Marc was there to deny the forward. A huge chance for Dinamo went begging as first – Bilinski was denied from a last ditch tackle from midfielder Andrei Prepeliţă, who showed his passion to get back to stop the forward. Bilinski was then denied again just seconds later as his left-footed strike from just inside the area forced Arlauskis in to parrying the ball. However, the Steaua keeper couldn’t clear his lines as the ball fell to Cosmin Matei who really should have done better from six-yards out. Szukala then headed the home side in front on the stroke of half-time following a dead ball, crossed in from Lucian Sânmărtean – in front of the Dinamo supporters, to the delight of the home contingent. Following the break – Steaua again looked the more likely to score and, they perhaps should have when Fernando Varela headed over from six-yards out. The defender was under no pressure at all and should have doubled his sides lead. Dinamo youngster, Dorin Rotariu, looked promising since his inclusion and forced Arlauskis in to making another save. However, it was Steaua who always looked the more prominent going forward and it was Papp who doubled the hosts lead, finishing in to an empty net after Popa did all of the hard work. Two minutes later and Keşeru had the ball in the back of the net again for Steaua to put the game beyond doubt – and to give the hosts a deserved three points who took their chances when it really mattered. Steaua are now five points clear in first place ahead of CFR Cluj who welcome Braşov to their stadium on Monday night. Steaua Bucharest XI (4-2-3-1): Arlauskis – Papp, Varela, Szukala, Filip – Prepeliţă, Sânmărtean – Ad. Popa, Chipciu, Tănase – Keşeru. Dinamo Bucharest XI (4-2-3-1): Marc – Fai, Nedelcearu, Cordoş, Grecu – Mansaly, Bărboianu – Lazar, Matei, Alexe – Bilinski. The Eternal Derby (Derbiul României) is one of the most fierce rivalries in Europe – it’s Steaua Bucharest vs Dinamo Bucharest and, it’s the two biggest teams in Romania. Different from the El Clasico (Real Madrid vs Barcelona) and AC Milan vs Inter Milan – the Eternal Derby: “Is of the biggest rivalries in the world. High level intensity, passion, emotion, colour and extreme hatred for a full 90 minutes,” said Alecsandru S, a Romanian football fan. The rivalry originates following the end of World War II, when Romania and much of Eastern Europe turned communist. Many of the football clubs were dissolved and new, communist clubs were established. 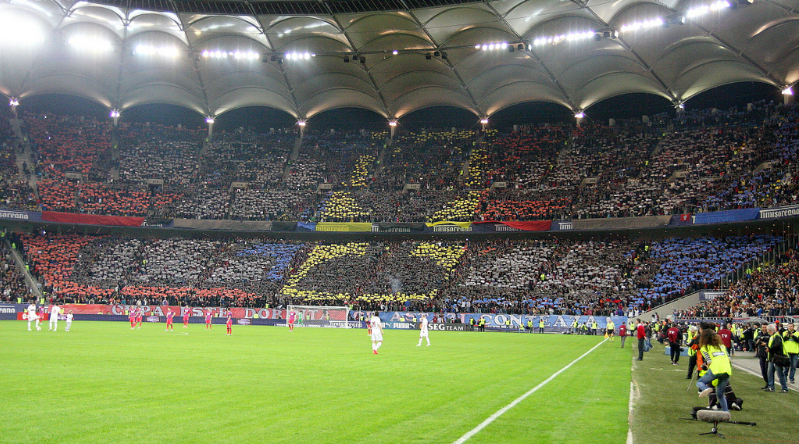 Steaua represented the Romanian Army whilst Dinamo, were represented by the Ministry of Internal Affairs. Many army personnel became Steaua supporters, whilst police officers and other civil servants, supported Dinamo. That been said, this doesn’t seem to be the case in today’s day and age, where young people tend to pick a side and stick to it. 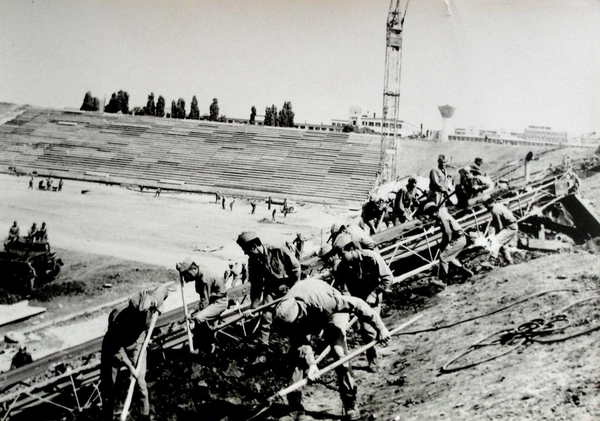 Communism in Romania fell in 1989 however, the rivalry was already mature and, because the two teams were backed – Steaua by dictator Nicolae Ceausescu and Dinamo receiving money from ministries – they were both giants in Romanian football. However, Steaua were more successful in Europe, having been crowned European champions in 1986 whilst they finished runners-up three years later. Romanian football started to grow in the 90’s and 00’s both on and off the field – mainly down to the ultra groups. Armata Ultra’s were formed on 4 December 1995 and were the second ultra group to originate from Romania, however, they were the first in Bucharest. Adopting a far-right ideology with very strict rules – the group soon reached 4,000 members. The Armata Ultra’s dissolved in 2001 and new, smaller groups started to appear – with different ideologies. Peluza Nord have a close and friendly relationship with the Steaua players whilst on the opposite side of the stadium, you have Peluza Sud, a much smaller group, but more fanatical. Gheorghe Mustaţă, a Steaua ultra, is currently serving seven years and five months in prison for organised crime and attempted murder. The Peluza Sud are more often involved in clashes outside the stadium and, they also have a link with CSKA Sofia ultras – often attending fixtures. Peluza Sud are currently protesting against the aggressive security forces presence at matches and missed Steaua’s last fixture. In 1996, Dinamo fans founded Nuova Guardia (New Guard) and just a year later, they set fire to the south stand at the Stadionul Ghencea (Steaua’s stadium). One of Dinamo’s ultras group, Peluza Catalin Haldan (PCH) – was named after the death of their captain, Catalin Haldan. A famous match between the two sides is that of 26 June 1988, a Romanian Cup Final that ended abruptly when one of the teams stormed off the pitch and refused to continue. Steaua were in the middle of a 60-match unbeaten run which stretched back to 1986 and included the European Cup Final win over Barcelona. The game was tied at 1-1 with a minute left to play, Steaua striker, Gavril Balint gave his side the lead just seconds from the whistle – only for it to be ruled out for offside. Distraught at the decision, the Steaua players stormed off the pitch in the direction of the club’s highest profile supporter Valentin Ceaușescu, son of dictator Ceaușescu. The referee abandoned the match and awarded the cup to Dinamo – only for the government to intervene the following day, ruling that the goal should have stood, making Steaua the winners. 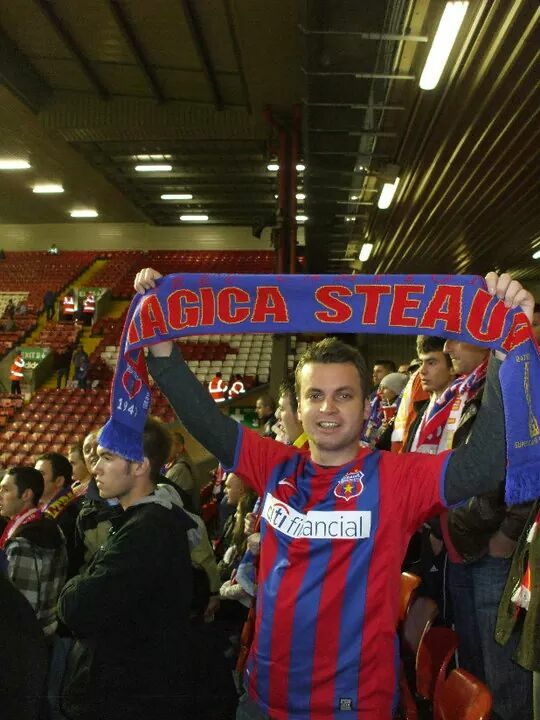 In modern history – Steaua went seven years without winning the league, to the disgust of their fans. “I remember one time in 2007, Steaua had one of their worst seasons and fans started to chant at the game before the derby: ‘If Dinamo beats us we will break your heads and smash your cars,’” recalled Alecsandru. Steaua won the Romanian league in 2013 whilst Dinamo have endured a poor run of late, having not won the league since the 2006-07 season. However, that doesn’t take away from the fact how big the Eternal Derby is – as this season the two teams are a lot closer, with just six points separating the two. In current times – the Steaua owner, general manager and as previously mentioned, the head of the ultras, all behind bars. Currently, the football club is being managed from jail and Becali (Steaua owner) is in permanent contact with the chairman and coach of the club. Dinamo have also suffered a bad period of late. After fearing bankruptcy, the club was saved in the last moment – thus resulting in Dinamo currently being banned from European competitions. Also, former Dinamo boss, Cristi Borcea (Becali’s Godson) is currently serving a six years and four months jail sentence for file transfers. This is when owners of clubs would declared amounts lower than the actual transfer fees – paying the remaining money in to an offshore bank account. Unlike most derbies, the two teams face each other tomorrow evening with just one win between the two. They have played each other 156 times in all competitions with Steaua winning 55 of those, and Dinamo winning 54, whilst drawing on 47 occasions. The two teams haven’t recorded a 0-0 draw since 15 May 1999. The home side (Steaua) have an injury crisis coming into the derby with no serious threat in the forward position. The hosts face Dinamo on the back of a loss in the Liga I – losing 1-0 to Târgu Mureş, which was marred with violence following poor refereeing decisions. Dinamo on the other hand are enjoying mixed fortunes of late – winning three out of their previous five in the Liga I. However, unlike Steaua, they face their rivals after a 3-2 win in the league against Pandurii Târgu Jiu.